cannibal: somebody who eats human flesh (technical) [Mid-16th century. 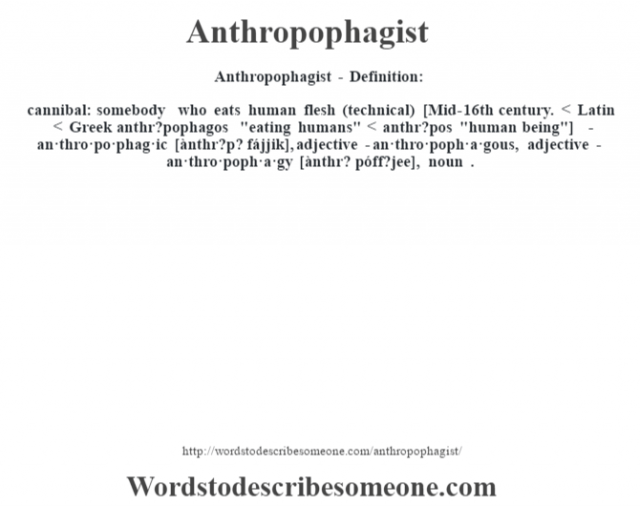 < Latin < Greek anthr?pophagos "eating humans" < anthr?pos "human being"] -an·thro·po·phag·ic [ànthr?p? fájjik], adjective -an·thro·poph·a·gous, adjective -an·thro·poph·a·gy [ànthr? póff?jee], noun .